Assistive devices are usually prescribed for people who need help with hearing loss or a voice, speech, or language disorder. The devices specifically help people to hear and express themselves more clearly, and consequently they are communicating better in every aspect of their daily lives. Assistive listening devices (ALDs) amplify sounds and hone in on what the individual wants to hear while blocking out background noises. 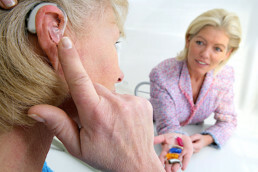 ALDs can be used with or without a hearing aid or cochlear implant. Augmentative and alternative communication (AAC) devices synthesize speech from text using a simple picture board or a computer program. These devices help people with communication disorders to express themselves. Alerting devices emit a loud sound or blinking light to get someone’s attention. These devices can easily be connected to a doorbell, telephone or alarm. While ALDs are all designed to improve sound transmission for people with hearing loss, there are actually several different types available for different settings. For larger facilities, such as theaters, churches, classrooms, and airports, ALDs include hearing loop systems, frequency-modulated (FM) systems, and infrared systems. For more personal settings, there are ALDs that are designed specifically for those one-on-one conversations. No matter what type of ALD is used, it can be used with or without a hearing aid or cochlear implant. For more information on ALDs that include hearing loop systems, FM systems, infrared systems, and personal amplifiers, check out this link to The National Institute on Deafness and Other Communication Disorders (NIDCD). NIDCD is a great resource to get additional information on assistive devices. If you would like a personal consultation to discuss assistive devices and how they may help meet your specific needs, please call the New Hampshire Hearing Institute (NHHI) at (603) 792-4327.